Edge of Death was not so good as a Vitality damage melee weapon: it was always outperformed by better alternatives such as Decree of Malmouth. However, with proper support it rocks in the campaign and Crucible. Today's build is designed to show the proper usage of this weapon. Meet the Edge of Death. It's a Death Knight using Cadence fully converted to Vitality, harvesting lost souls over the battlefield. Massive weapon damage boost provided by Soul Harvest and Deadly Momentum makes every Cadence hit really hard. 200% attack speed and no slow WPS procs ensure you'll hit with Cadence very frequently. 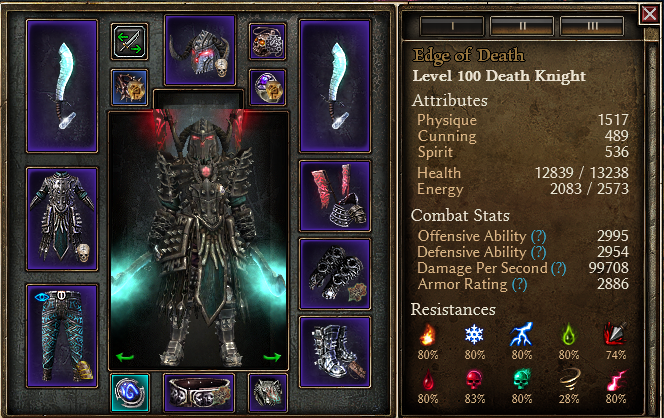 Mythical Edge of Death is the core weapon of this build. Actually I wanted to make a good use of Edge of Death and I made it. Counter Strike boosted by Blood Knight set is somewhat useful; I didn't measure its impact on build's overall performance, your main damage comes from Cadence. I believe its ADCtH helps if you're surrounded. Strong defenses including 32% constant ADCtH, 2* Bloodthirster and Mark of Torment in rotation, Counter Strike, high armor, moderate DA and Ghoul on top of that. Necessary secondary resistances are capped: 80% to Slow (with my rolls of gear), 30% to Trap and Stun, 46% to Freeze, 100% to Skill Disruption (I dont really need it, but these legguards provide a large chunk of it). ~130 Vitality RR - any single target including Kuba gets melted. Strong DoT damage as a side effect: up to 130k Vitality Decay ticks. I invested only 1 pt into Reaping Strike and 1 pt into Markovian's Advantage, because damage increase from boosting them is negligible. You do much more damage with Cadence. Acid Spray bound to Soul of Nazaran works great, and all bindings are balanced to ensure the most comfortable proc rate. Direwolf's Crest provides the Aether resistance, OA and enables us to wear 2 swords. Doom relic is surprisingly BiS damage-wise, with Uroboruuk's Reaping your weapon damage is lower. Reforged Chains of Oleron belt is much better damage-wise too, but current belt provides lots of OA, so I decided to leave it. Stacking flat physical damage here is a must. Overall this build is well-rounded and all resistances are fit near softcap. If you feel unsafe, swap the pants and boots for ones you like better. Aggressive melee combat: debuff 'em and reap everyone. All combinations of nemeses are facerolled. Kuba is facerolled little slower. sir spanksalot - great advices on gear. Last edited by veretragna; 08-28-2018 at 06:22 PM. 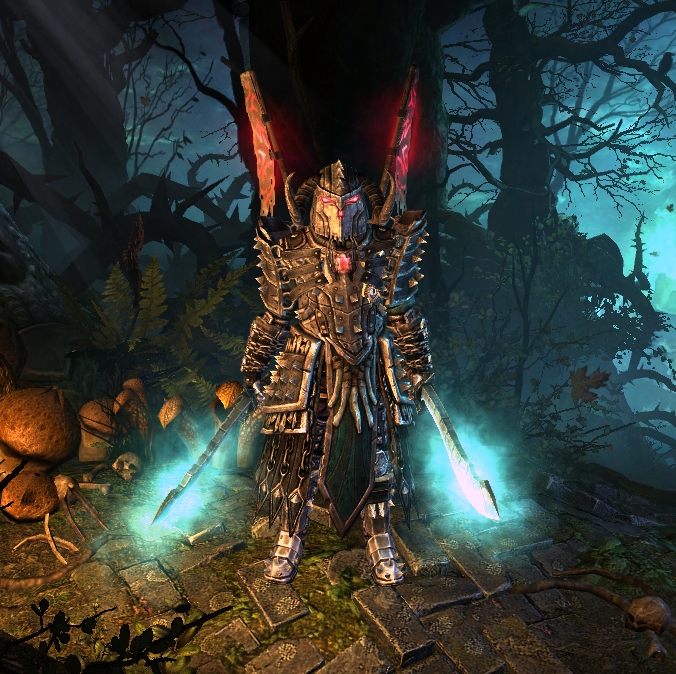 Btw it's my very first vitality build :3 I hope you'll enjoy it as much as I did. Ha. They healed aleks this time ya noob. EDIT: I had actually typed that in caps. 2nd EDIT: I can literally hear you saying, 'cyka blyat' across not just the internet, but through time as well. Last edited by sir spanksalot; 08-05-2018 at 08:52 PM. I thought I killed these healers! It really goes to show how well done the build is if it can perform at this level with veretragna as the pilot. Nice, actually using that weapon. But to be honest the set is doing the heavy lifting here, I feel it could work with other weapons too. Weapon looks really cool. Glad to see you finally make use of these blades! Grats on another build! Looks good. Looks really good Vere. It seems, I need to level a death knight soon. Although I am sad that you don't use necrotic edge . Cadence interaction to the WPS is not good, so it's understandable.